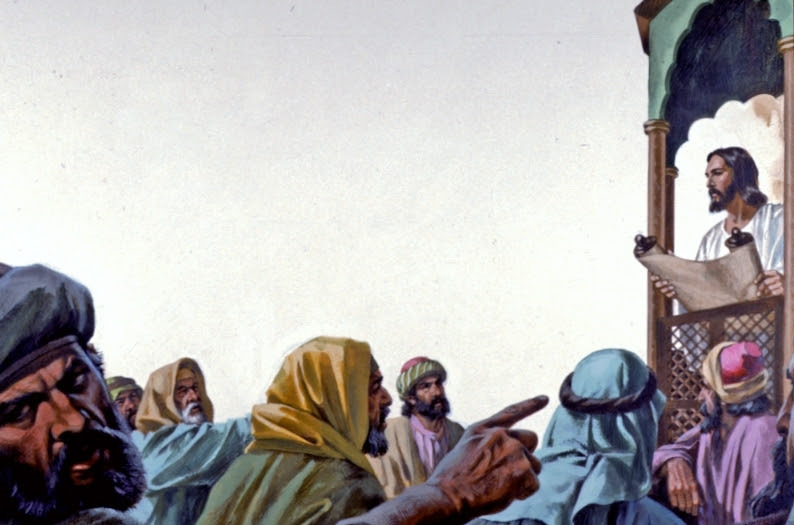 NO PROPHET IS ACCEPTED IN HIS OWN NATIVE PLACE - Today's Gospel (Luke 4:21-30) is a continuation of last Sunday's Gospel, wherein Jesus proclaimed to be the fulfillment of the prophesies of Isaiah. He then cited two prophets Elijah and Elisha who, after rejection by their own people, chose to focus their ministry on Gentiles. In a way, this scene also prefigured Jesus' final week in Jerusalem - after initial praise and adulation on Palm Sunday, he was rejected and put to death. 'Today this Scripture passage is fulfilled in your hearing.' And all spoke highly of him and were amazed at the gracious words that came from his mouth.They also asked, 'Isn't this the son of Joseph?' He said to them, 'Surely you will quote me this proverb, "Physician, cure yourself," and say, 'Do here in your native place the things that we heard were done in Capernaum.' And he said, 'Amen, I say to you, no prophet is accepted in his own native place. Indeed, I tell you, there were many widows in Israel in the days of Elijah when the sky was closed for three and a half years and a severe famine spread over the entire land. It was to none of these that Elijah was sent, but only to a widow in Zarephath in the land of Sidon. Again, there were many lepers in Israel during the time of Elisha the prophet; yet not one of them was cleansed, but only Naaman the Syrian.' When the people in the synagogue heard this, they were all filled with fury. They rose up, drove him out of the town, and led him to the brow of the hill on which their town had been built, to hurl him down headlong. But Jesus passed through the midst of them and went away." Our first reading (Jeremiah 1:4-5, 17-19) might have been one Jesus thought about as his townsfolk were attempting to drive him off a cliff. In this passage, God reassured Jeremiah that God chose him even before he was in the womb, and though he will suffer and be persecuted for speaking God's truth, God is with him and will deliver him. before you were born I dedicated you, a prophet to the nations I appointed you. But do you gird your loins; stand up and tell them all that I command you. Be not crushed on their account, as though I would leave you crushed before them; for it is I this day who have made you a fortified city, a pillar of iron, a wall of brass, against the whole land: against Judah's kings and princes, against its priests and people. They will fight against you but not prevail over you, for I am with you to deliver you, says the LORD." In our Epistle reading (1 Corinthians 12:31-13:13), Saint Paul caps off his writing from the previous two Sundays about the various gifts of the Spirit with the "piece de resistance", the central gift that all God's people share in the Spirit - Love. "Brothers and sisters: Strive eagerly for the greatest spiritual gifts. But I shall show you a still more excellent way. If I speak in human and angelic tongues, but do not have love, I am a resounding gong or a clashing cymbal. And if I have the gift of prophecy, and comprehend all mysteries and all knowledge; if I have all faith so as to move mountains, but do not have love, I am nothing. If I give away everything I own, and if I hand my body over so that I may boast, but do not have love, I gain nothing. "Love is patient, love is kind. It is not jealous, it is not pompous, It is not inflated, it is not rude, it does not seek its own interests, it is not quick-tempered, it does not brood over injury, it does not rejoice over wrongdoing but rejoices with the truth. It bears all things, believes all things, hopes all things, endures all things." Like Jesus, we too may encounter rejection and even possibly violence, especially if we are so bold as to speak God's truth to those unwilling to listen. But we should take heart that like Jeremiah and Jesus himself, God is always with us and will deliver us. And the vehicle through which God will deliver us is Love. It is Love that endures all things.